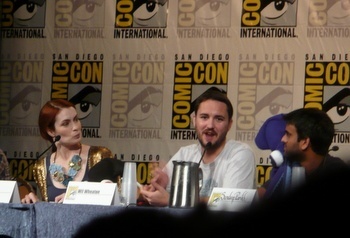 At their panel at Comic Con, Felicia Day and the cast (including Wil Wheaton) showed off a new music video "Game On!" with a distinct Indian flair. According to producer Kim Evey, it was all Zaboo's idea. Sandeep Parikh, who plays the annoying gamer friend to Day's Codex, said that it was the only way to get his Indian heritage into the show. The Guild knew that their first music video, "Do You Wanna Date My Avatar?" was wildly successful, and they were looking for ideas to do a second one. Attendees of their panel at Comic Con got to see the completed new music video, "Game On," which hilariously parodies Bollywood dance numbers. The cast and crew went all out for this one. Day's character, Codex, has decided to take a break from playing their MMOG of choice (We all know it's WoW right? ), and Zaboo convinces her to start playing again through the song. The whole song is duet between Zaboo and Codex complete with an "almost kiss." Recruiting an elephant and some crack special effects guys, the dance number was surprisingly well choreographed and executed. All of the cast members were represented, but my favorite bit was Vork (played by Jeff Lewis) dressed in a 8-armed Vishnu-like get-up and singing in Hindi. I won't spoil much more but it's pretty damn funny. There's no word on when it will be released publicly but I'd look for it soon as it seemed complete. If you need a celebrity endorsement, Wil Wheaton remarked after the premiere, "That was frakking awesome!" The rest of the panel was not that interesting, to be honest. Too much time was spent thanking people and sponsors. It's my opinion that when you have an open stage with all of the actors and creators present, you should spend the time giving the fans the insights into the show that they crave. Instead, a good 40% of the panel was spent thanking Microsoft for giving them money and other sponsors, as well as calls for applause for every person who worked on the show ever. Not the correct venue, guys. Let the fans hear you talk about the show. They didn't wait in line 2+ hours for a commercial.